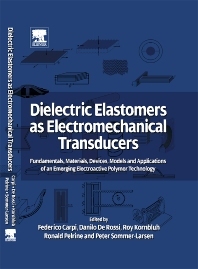 Dielectric Elastomers as Electromechanical Transducers provides a comprehensive and updated insight into dielectric elastomers; one of the most promising classes of polymer-based smart materials and technologies. This technology can be used in a very broad range of applications, from robotics and automation to the biomedical field. The need for improved transducer performance has resulted in considerable efforts towards the development of devices relying on materials with intrinsic transduction properties. These materials, often termed as “smart” or “intelligent”, include improved piezoelectrics and magnetostrictive or shape-memory materials. Emerging electromechanical transduction technologies, based on so-called ElectroActive Polymers (EAP), have gained considerable attention. EAP offer the potential for performance exceeding other smart materials, while retaining the cost and versatility inherent to polymer materials. Within the EAP family, “dielectric elastomers”, are of particular interest as they show good overall performance, simplicity of structure and robustness. Dielectric elastomer transducers are rapidly emerging as high-performance “pseudo-muscular” actuators, useful for different kinds of tasks. Further, in addition to actuation, dielectric elastomers have also been shown to offer unique possibilities for improved generator and sensing devices. Dielectric elastomer transduction is enabling an enormous range of new applications that were precluded to any other EAP or smart-material technology until recently. This book provides a comprehensive and updated insight into dielectric elastomer transduction, covering all its fundamental aspects. The book deals with transduction principles, basic materials properties, design of efficient device architectures, material and device modelling, along with applications. Federico Carpi received the Laurea degree in Electronic Engineering in 2001 and the Ph.D degree in Bioengineering in 2005 from the University of Pisa, Italy. He currently has a post-doctoral position at the Interdepartmental Research Centre “E. Piaggio” of the University of Pisa. His main research activities are focused on polymer materials and devices for biomedical engineering and robotics. Danilo Emilio De Rossi received the Laurea degree in Chemical Engineering from the University of Genoa in 1976. He was researcher of the Institute of Clinical Physiology of C.N.R., Italy until 1981. Since 1982 he has been working in the School of Engineering of the University of Pisa, where he is presently Full Professor of Bioengineering. His scientific activities are related to the physics of organic and polymeric materials, and to the design of sensors and actuators for bioengineering and robotics. Roy Kornbluh is a Senior Research Engineer at SRI International, where he has worked for the past 20 years. Recognizing the need for a new generation of robotic actuators, Mr. Kornbluh helped conceive dielectric elastomer artificial muscle. He has authored more than 40 papers on dielectric elastomers and is active in the electroactive polymer research community. Ron Pelrine is a principal inventor of dielectric elastomer transducers and has been active in the field since 1992. Along with other researchers at SRI International, Dr. Pelrine laid the foundations of dielectric elastomer transduction, and was the first to discover both silicone and acrylic as dielectric elastomer materials.